On the top shelf on the right hand side, you will almost always find a container of homemade bliss balls. 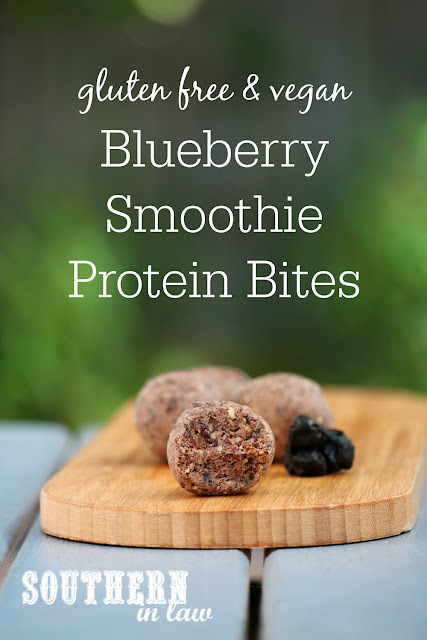 They're the perfect on the go snack as they're bite sized and protein packed - but really, we keep on making them just because they're delicious. 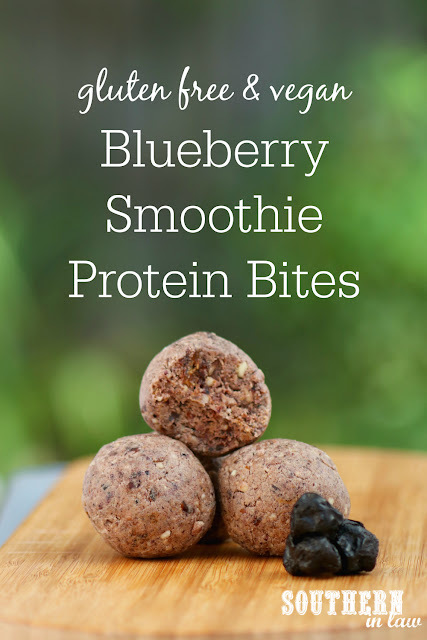 If Jesse gets home and doesn't see some kind of new baked treat on the counter top, he'll head straight to the top right of the fridge to grab a protein ball - particularly if it's this No Bake Cookie Dough Protein Balls Recipe (his all time favourite). Lately, however, there's a new favourite in town! 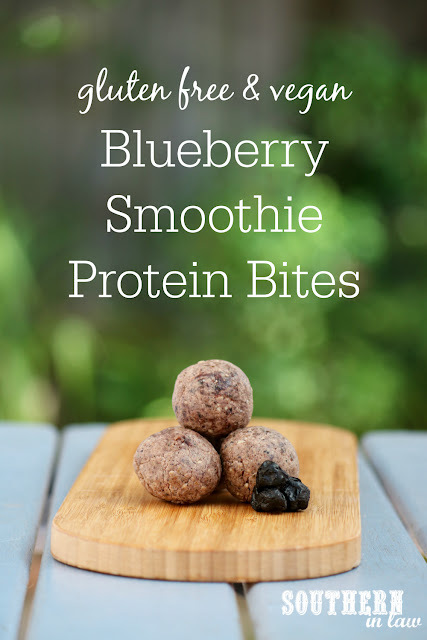 Originally I planned on making blueberry muffin bites, however, I decided mid way through to make a portable version of a blueberry protein smoothie and oooooooh mama was it a good idea! 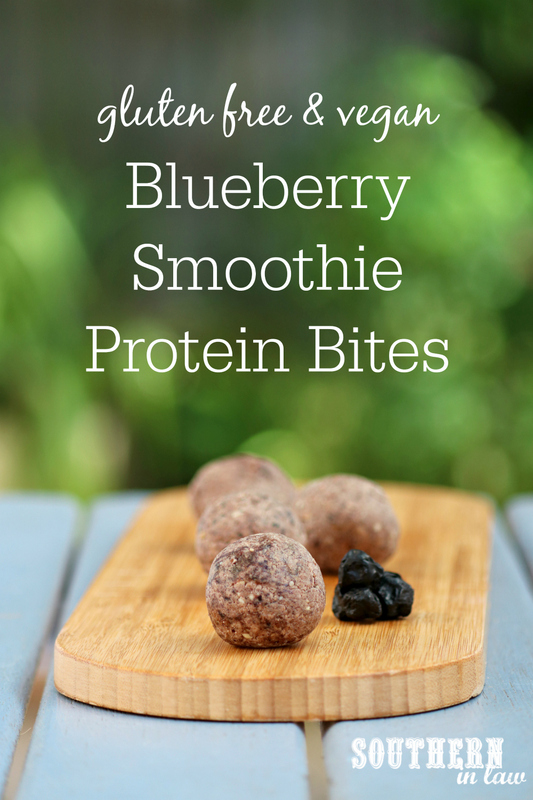 These Blueberry Smoothie Protein Balls are all sorts of delicious - and so simple to make! Place your dates, blueberries and cashews in a food processor and process until finely chopped (it will take some time, but don't worry! They will break up!). Add your protein powder and 1 tsp of water and process until combined. If needed, add a little bit more water to bring everything together. If you've added too much water and your mix is too moist to roll, add a tablespoon or so of coconut flour to firm them back up. Roll your mixture into balls and place in an airtight container. Enjoy immediately or chill in the fridge to eat later. These protein bites will keep in the fridge in an airtight container for a few weeks and can also be frozen for longer storage. *I use this unsweetened and unflavoured whey protein powder for mine, however, you can use your favourite plain or vanilla protein. Obviously use a vegan or paleo friendly protein if you need it to be that! What's one thing you always have in your fridge?